Fantasy Football? Sure but not the way your thinking of it... This is fantasy football from the land of FrolicHaven, the magical world where stuffed animals and toys come to life. This is the kind of football where how smart you play is a lot more important than how big or fast you are. 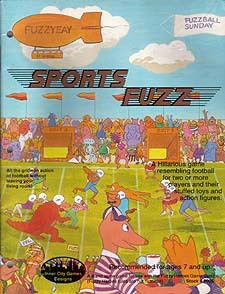 Sports Fuzz! lets you be the coach of your own team, or just part of a team if you wish. It gives you the running backs you've always dreamed of, a quarterback most professional teams would give their entire teams for, and a frontline that would be the envy of any professional team. You'll have a defense that would bring tears to the eyes of coaches across the country. Sacks and interceptions, blocked punts and field goal attempts, strips and blitzes, all of these are second nature to the defense you'll run.